Manual construction of wooden houses is a challenging and labour-intensive process. At our company “North House” we do our best to facilitate carpenter’s work. We constantly evolve and acquire new cranes and saw benches. Presently our company is a recognized leader in wooden house construction due to our modern equipment and building technologies, which allows us to reduce the cost of 1m², improve the quality of wooden houses and shorten the time of construction. Our company is also the only one to organise dry wood construction sites under protective canopies in order to achieve the highest quality and to preserve the exterior of the log house. 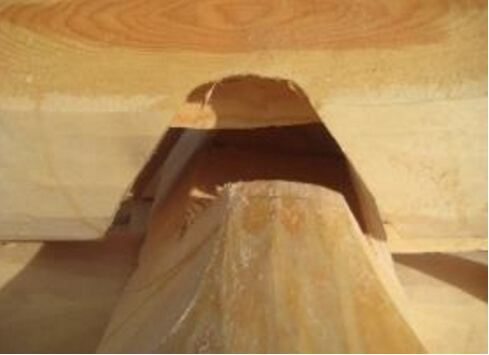 The availability of a good table saw allows to maintain geometry up to 1mm during the process of sawing lumber. It is vital for the construction of two-edged cant houses and wooden frame buildings, poles, beams and other structural elements. Hydraulic feed helps to facilitate work of handlers and guarantee high standards of production; it also saves time during sawing. Precision of lumber sawing is the foundation of construction quality of a future wooden house.The main goal of table saws is to prepare all the required materials for the building and to ensure their quality at the very beginning of the project. We have two automatic sliding table saws: one is for standard logs up to 6m in length and another one for lumber up to 12m long. Manual construction of a wooden house requires сonstant availability of a tower crane. 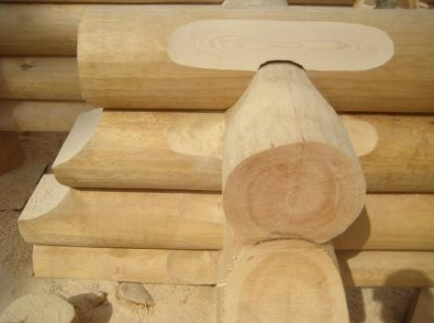 In order to fit one log properly and precisely, it is first raised to the frame of logs and outlined, then lowered down to the ground, where grooves and notches are sawed out, and finally lifted back. It usually takes at least two times to lower down and raise each log. Only on the ground it is possible to work on a log precisely and up to a high standard. Depending on the stage of construction, treating the log on the frame of logs requires working in an uncomfortable position with a power saw, which is above all dangerous and makes it impossible to achieve the desired quality of work. Company “North House” has four radio-controlled tower cranes Libher C20. We were the first to use such tower cranes in Saint Petersburg. The construction of wooden houses does not require a big load capacity, but it necessitates precision and operating speed from the lifting equipment. The tower cranes that we use fully meet these requirements. We also use this type of tower cranes during the mounting of log frames onto the foundation, which allows us to assemble the house from one point without the cumbersome process of moving the crane, such as truck crane, to three different places around the construction site. This equipments allows us to substantially reduce expenses, such as energy costs, wages (a tower crane does not need to be manned at all times) and time that is spent on construction.